This article is about the class of moves. For moves of this class with a similar name, see Counter (disambiguation). Lucario's Double Team is an example of a counterattack. A counterattack is a type of special move. Debuting in Super Smash Bros. Melee, a counterattack will, on use, put the user into a shield-like state followed by a sizable period of lag. Should any normally blockable attack hit the user during these guard frames, the attack will be blocked (without depleting the health of their shield) and the user will automatically retaliate with an attack of their own, presumably hitting whoever was attacking unless it was a projectile, or some other attack that out-ranges the counter. Some counterattacks do more damage when they activate against a stronger attack, with knockback scaling to match the damage, while some deal a fixed amount of damage. Counterattacks usually activate fast enough that it is impossible for a melee attacker to shield the retaliating hit, although the attack itself can usually be blocked; there are a few exceptions, such as Shulk's Vision in Super Smash Bros. 4, which is unblockable. A correctly-timed counterattack can tilt the momentum of a match towards the user, though as they are generally not effective on reaction, reading the opponent is crucial. Simply using counters repeatedly in hopes of successfully landing one in will result in a competent opponent waiting until the move's lag to attack, or simply using a grab, which is immune to counterattacks. While unblockable attacks cannot be countered (except with Witch Time), as previously mentioned, depending on the move, the user may still not receive damage because of the initial invincibility frames. Unlike reflectors, there is no limit to how much damage can be countered. In SSB4, however, there is a cap on how much damage a counterattack can inflict, at 50%. The only exception is Shulk's Vision; its damage cap can be raised or lowered depending on which Monado Art is currently active. In SSB4, counterattacks also cannot counter some explosive attacks, such as Link's Bombs and Steel Diver missiles, and instead give the user protection against them during the counter frames. Stronger explosions can be countered, however, such as the Bob-omb. Prior to SSB4, counterattacks lacked any special aesthetics upon activating. In SSB4, most counterattacks, upon activating, emit a unique particle effect identical to a sinus rhythm. This applies to all counterattacks lacking a separate particle effect, namely the entire cast that possesses a counterattack, save for Greninja and Lucario. Each counterattack's sinus rhythm is distinct (ex. Palutena's is blue, Little Mac's is red, etc.). In Super Smash Bros. Ultimate, an additional visual effect occurs if a strong enough attack is countered, with the user emitting a large, bright yellow flash. Counterattacks only available as custom moves are in italics. Bayonetta Witch Time Bayonetta performs a stationary backflip that slows down the opponent for a certain period of time, based on the overall damage of the opponent and how frequently Witch Time itself is used. If performed too late, she instead activates Bat Within, a teleport that reduces the amount of damage taken. Unlike most counterattacks, Witch Time does not damage the opponent, but allows Bayonetta to perform any attack while the targets are slowed down. This is the only counterattack in the series that is capable of countering non-grab unblockable attacks. Chrom Counter Functionally identical to Roy's Counter, with the only difference being the lack of a flame effect. Corrin Counter Surge Corrin transforms into a dragon, dodges the opponent's attack, and stomps the ground, launching opponents vertically on both sides with surges of water. This is one of the two counterattacks in the series that sends opponents directly upwards, instead of diagonally in a given direction (alongside Mii Swordfighter's Blade Counter in Ultimate). It is also the only counterattack that avoids attacks instead of negating them; thus, single-hit projectiles will not shatter upon contact, and other attacks can hit other opponents nearby when the counter is triggered. Daisy Toad Functionally identical to Peach's Toad, but with a blue-spotted Toad. Dark Pit Electrocut Arm Instead of dashing with his arm, Dark Pit remains stationary while wielding the Electroshock Arm ready (moving backwards slightly when doing so) and retaliates if any attack hits him. While this removes one of Dark Pit's recovery options, the attack will be stronger and gives him super armor to compensate. Dark Pit will also attack if something or someone gets too close. Greninja Substitute Greninja vanishes, being replaced by a green doll or a wooden log, and then reappears while attacking with a sliding kick with eight possible directions, controllable by tilting the left control stick. The ability to control the direction of Greninja's dash allows it to confuse opponents or even use this counterattack as a recovery. If aimed directly downwards, Substitute will meteor smash opponents if it lands. However, the counterattack is slow enough to avoid/shield (much like Lucario's Double Team) and does not give Greninja intangibility or invincibility, making it possible for multi-hit attacks to interrupt the counterattack. Ike Counter Ike's Counter does 1.2× the damage of the attack, with a minimum of 10%. In Brawl, it has higher start-up before the counter window when compared to Marth's, although Ike's version has less ending lag. SSB4 removes some of the increased start-up (frame 9), putting its speed more in line with Marth's, and it has the second longest counter window in the game (surpassed by Lucario and Shulk's counters). Incineroar Revenge A weak counterattack that prevents knockback, but decreases the damage received roughly by half instead of negating it. In addition, it increases the damage and knockback of the next attack Incineroar lands, and has the fastest start-up of any counterattack in the series (frame 3). Joker Tetrakarn Will only counter when Arsene appears; otherwise, he uses Rebel's Guard which halves the damage taken and quickly fills his Rebellion Gauge. King K. Rool Gut Check K. Rool will expand his stomach and counterattack any damage and/or reflect any projectiles. However, the counter/reflection hitbox is confined to K. Rool's stomach, leaving him open to attacks from above, below, or behind. Little Mac Slip Counter Little Mac does a fake-out, dodging the opponent's attack, and socks them with an uppercut while dashing forward. Said dash can make Slip Counter a useful though risky horizontal recovery option. Tied with Double Team and Gut Check for having the quickest start-up of any counterattack (frame 5). Little Mac is invincible while counterattacking, unless Slip Counter activates in the air. Lucario Double Team Lucario vanishes out of the way of an attack and reappears behind the opponent, striking them with a flying kick. He has the option to attack in the opposite direction too. It is the slowest of all counterattacks to hit once activated, to the point of it being possible to simply avoid in some cases, along with being able to be shielded. Its power does not change based on the activation attack, but is instead dependent on Lucario's Aura. It has a base damage output of 11%, and at maximum Aura, it has incredibly high knockback, to the point of being able to KO medium percentage opponents. Lucina Counter Functionally identical to Marth's, but with a different animation. Acts faster than Roy or Ike's, but has more lag afterwards. Marth Counter In Melee, Marth's Counter does 7%, regardless of the attack. In Brawl, it has a multiplier of 1.1×, with a minimum of 8%. In SSB4, its multiplier is 1.2× and has higher base knockback, which make it much more reliable at KOing via Countered strong attacks at lower percents. Acts faster than Roy or Ike's, but has more lag afterwards. Mii Swordfighter Blade Counter The Mii leans back a bit and holds their sword behind them in reverse grip. Should anything attack them during this, the Mii will respond with a quick slash. In Ultimate, the retaliating slash sends vertically instead of horizontally. The counterattack has a multiplier of 1.25×, with a minimum of 8%. Mii Brawler Counter Throw The Brawler takes a defensive pose with their hands covering their face. If an opponent hits the Brawler while they are in their counterattack frames, the Brawler proceeds to grab the opponent and throw them behind them (however, it fails to counter projectiles or any attacks hitting the Brawler's legs, and sufficiently disjointed attacks can cause the throw to fail to connect). The attack has a multipier of 1.5×, making it one of the strongest counterattacks in the game, tied with Gut Check. Also of note is how quickly the Brawler can attempt another counter if it fails; they can attempt to counter nearly twice as fast as most other characters (specifically, a failed counter for the Brawler ends after a mere 38 frames, while Ike, for example, does not regain control until 73 frames have passed). Palutena Counter Palutena puts up her shield, and if hit while it is active, she strikes back with her staff. The staff's length gives this counterattack a slightly longer horizontal range than most, though it is still small relative to Palutena's size; additionally, its vertical range is minimal. Also one of the two counterattacks with a sourspot in SSB4 (along with Vision), and has relatively low knockback scaling. In Ultimate, this move is combined with Reflect Barrier, allowing it to also serve as a reflector. Peach Toad Peach pulls out Toad and holds him in front of herself. Toad operates slightly differently than other counterattacks: Peach does become invincible during part of the move, but not for the entire counterable duration, and hitting her does not activate the counter. Instead, Toad has a separate hurtbox that activates the counter, which is a set of nine spore shots that each do 2% and fire at random angles. The spores are projectiles, and thus can be absorbed and result in the move having the longest reach of any counterattack. In Smash 4, the counterattack activates if Peach is hit anywhere, making it more reliable. In Ultimate, Peach now crouches behind Toad, who guards her by himself. Pit Interception Arm Just like Dark Pit's Electrocut Arm, Pit wields the Upperdash Arm and remains stationary while talking a small step back, attacking if hit or if an opponent gets too close to him. The attack is stronger than Pit's default side special and grants him super armor. Roy Counter Roy's version of this move is aesthetically unique, as it creates an explosion when he attacks. In Melee, Roy's Counter has a multiplier of 1.5×. 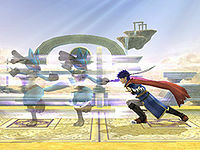 In SSB4, Roy's Counter activates 3 frames later than Marth's (frame 8) and has a shorter duration. However, it has a multiplier of 1.35×, with a minimum of 8%. Shulk Vision Shulk leans forward and holds the hilt of the Monado, and attacks with an outward slash if hit. It is unique as it possesses two different versions: a slow but wide-ranged slash, or a quick dashing slash with higher base knockback that can be only done if Shulk is grounded. It has the longest counter window in the entire series when fresh, but the window becomes shorter each time the move is used. The window can be recharged over time by simply not using the move. Additionally, it is one of the two counters with a sourspot in SSB4 (along with Palutena's Counter). Villager Timber Counter Rather than being a standard counterattack, Timber Counter gives the Villager's tree a longer lifetime and the ability to damage opponents if they hit it when fully grown. Other stages of the attack allow the tree to disrupt opponents, such as the sapling tripping opponents if they walk over it, though the tree deals less damage if chopped down. The tree also pulses red periodically, making it more obvious than Timber. Shulk's Vision hitboxes in SSB4. Roy's Counter in Melee and Smash 4 both had the highest damage multiplier in the game by default, dealing 1.5× and 1.35× damage of the attack countered, respectively. In Smash 4, only Shulk's Vision with the Buster Monado Art active could match that damage multiplier. In Ultimate, the Mii Brawler's Counter Throw and King K. Rool's Gut Check initially had the strongest damage multipliers in the game by default (1.5×). With the release of Joker, Rebel's Guard surpasses their damage multiplier of 1.6×, making it the most damaging multiplier in the game. As a result of this, both moves now ranked the second highest damage multiplier in the game. Marth and Lucina’s Counter in Smash 4 is somewhat infamous of being used as an edge-guarding tool due to its fast startup with increased knockback, being able to gimp most characters with poor recoveries at low strength. In Ultimate it has more ending lag making it riskier off stage, but remain an effective tool. Shulk's Vision in SSB4 is arguably the most potent of all standard "hit-and-retaliate" counterattacks, thanks to its high damage multiplier and knockback, alongside the longest counter window of any counterattack; opponents will tend to trigger the counterattack due to its sheer duration. The move has been nerfed in Ultimate, as it has less knockback growth and is no longer unblockable, making the move worse at KOing. Corrin's Counter Surge launches opponents upwards and can infamously KO aerial opponents at high blast zones at any percent range depending on the move. Its damage multiplier was originally 1.3×, which allowed Corrin to KO opponents at a very low percentage against uncharged smash attacks, which made it the most potent counterattack in the game by far, despite having a lower multiplier compared to Roy's Counter and Shulk's Buster Art-boosted Vision. As of update 1.1.5, its multiplier has been lowered to 1.2×, which brought its power much more in line with other counterattacks. In Ultimate it was once been weaken again giving less knockback, had reduced range, and can no longer be interrupted as early. Bayonetta's Witch Time in SSB4 is considered to be the best counterattack in the game, thanks to its ability to slow enemies down, thus granting Bayonetta a very forgiving time window to set up into her extremely effective combo game. Additionally, it is very safe for a counterattack, thanks to it granting intangibility during the move, while being hit at the end of Witch Time triggers Bat Within, halving damage taken from the attack that triggered it. However, it is significantly less effective in Ultimate because of its duration being much shorter on enemies below 100% and its lack of intangibility. Joker's Rebel's Guard, King K. Rool's Gut Check, and Palutena's Counter/Reflect Barrier in Ultimate are notably the only counterattacks that can also function as a reflector. As noted, the Mii Brawler's Counter Throw is unique in many ways: alongside it having an extremely high damage multiplier of 1.5×, it is also very quick overall with very low startup and ending lag, but a narrow counter window. It also completely fails against sufficiently disjointed hitboxes and will not negate projectiles, while leaving the Brawler's legs vulnerable. As a result, it is a speedy but high-risk high-reward counterattack. Incineroar's Revenge is a unique buff-inducing counterattack: it will minimize damage taken from an attack and gain a "stack" of Revenge depending on damage countered, weakly knocking nearby opponents back but significantly powering up the next move that connects with an opponent. With enough stacks, Incineroar is capable of dealing 70% in a single hit with certain moves (smash attacks, Alolan Whip), giving it the strongest possible attacks of any character without modifiers (such as Spirits). Robin's forward smash being countered by Marth, Ike, then Roy in sequence. It is possible, albeit difficult, to counterattack a counterattack. This is seen in Roy's introduction video for SSB4. If done perfectly with multiple players, counterattack damage can be stacked consecutively until it reaches the 50% cap, which is usually accompanied by one-hit KO power. Due to Toad being the only neutral special counterattack, it is the only counterattack that Kirby can copy or use. Sixteen characters utilize a counterattack in SSB4, twelve of which are available by default. As a result, SSB4 has become somewhat notorious for the high number of counterattacks it features, especially compared to Melee and Brawl, which have three and four, respectively. Ultimate continues the trend, with an additional three characters, bringing the total up to nineteen, with only one not available by default. This page was last edited on April 21, 2019, at 23:12.